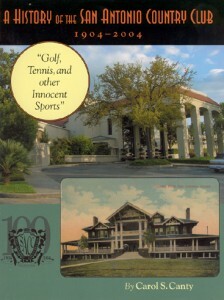 To celebrate the 100th anniversary of its founding, the San Antonio Country Club undertook to compile its history, and found amongits own members an expert researcher and writer to plumb the files for facts and gather photographs from members. SACC was one of the first country clubs organized in Texas, and played a major role in the development of golf and tennis in the early twentieth century, both locally and at the state level. The Club has weathered fire, wars, the Depression, and recessions, and its membership rolls through the decades list the names of many of the “first families” of the city – those who have quietly kept the Alamo City going and growing from then to now. A big beautiful book chock full of photos, the strong emphasis on sports shows the club’s origins, and the extensive color picture section covers everything from early buildings and golf groups to recent parties and the extended and devoted staff who run today’s institution.